The Dollar Photo Club is set to terminate all its services on April 15, 2016. This means that the stock photo website will be shutting its doors permanently in less than two weeks. The stock site and its parent Fotolia were acquired by Adobe Stock in January 2016, but the announcement came via their Facebook page in March, informing members and non-members alike to find a better Dollar Photo club alternative. There are so many reasons why the Dollar Photo Club closure is disappointing. Its $1 for every image rule will surely be missed. More importantly, current members will not be able to refund their membership. This means that they will not be able to get their remaining downloads, unless they move to Adobe Stock. The latter is a good website. Don’t get us wrong, but it just doesn’t offer the same Dollar Photo club experience that members are used to. We, at Stock Photo Secrets, only want the best for creative professionals around the world. We want you to get value for your money. That’s why we are introducing a new stock photo website that offers fairly the same kind of product as the Dollar Photo Club, plus a little bit more. 99 Club offers DPC members and non-members alike the opportunity to download two times more images than their soon-to-be ex stock photo website offers. With the Dollar Photo Club closed soon, 99 Club becomes the best alternative in the market. It has over 4 million high quality images in its collection, with 60,000 to 80,000 more added every month. All images possess a royalty-free license that allows you to use them in any project – even after your subscription expires. They also include the necessary model and property releases, so you do not have to worry about the small stuff down the road. A 99 Club membership entitles you to access its continually growing collection of stock photos, vectors and premium fonts. It allows you to download 200 professional quality mages (of any size) for only $99 per year. It also gives you an exclusive price $0.99 for every image you download when your creative needs exceed 200. Moreover, it has no additional fees or auto-renew. You can keep your membership for as long as you like. The Dollar Photo Club closure is not entirely a bad thing. 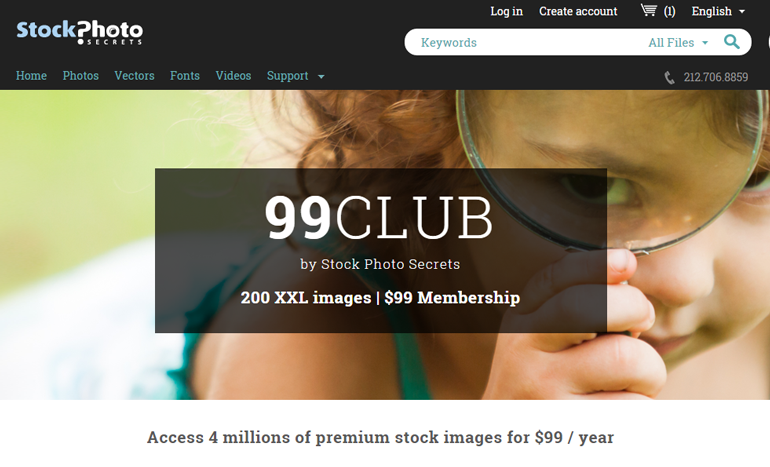 It also opens the creative community to a better opportunity with Stock Photo Secrets’ 99 Club. It offers fairly the same type of product, and a bit more. If you are looking for a stock photo website that offers affordable images and the same Dollar Photo club experience, you should check out 99 Club. It only has a limited membership availability, so you should hurry and sign up today.